I have a friend and colleague who seems to enjoy cooking nearly as much as I do. And I’ve noticed that most, if not all of the recipes that she’s raved about include bacon. I’ve called her on this and she readily confesses: everything’s better with bacon. In a 10-inch straight-sided sauté pan, fry the bacon until it’s nearly done–not quite crispy. Remove from the pan and set aside. Heat the olive oil over medium heat. Add the mushrooms and rosemary. Season with the salt and then stir well to combine. Turn the heat down to medium low and cook, stirring occasionally at first and more frequently when the mushrooms begin to release their liquid. 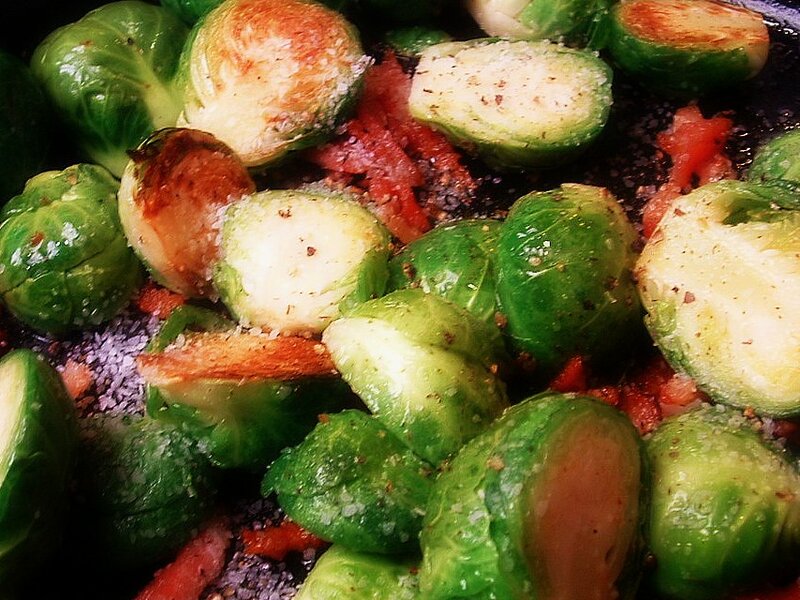 Then add the Brussels sprouts and toss until they begin to become tender and brown, all together about 25 minutes. Remove the pan from the heat, remove the rosemary stems, and add the butter pieces. Stir gently until all of the butter has melted. Give a generous squeeze of lemon over all and stir again. Taste, and if needed, season with more lemon. Serve warm.